A bright sharp copy of what is considered to be the first work to feature a criminal protagonist, and the first great gentleman rogue of mystery fiction - Colonel Clay. A clean and wonderfully bright, thus rare, jacketed first edition of this thrilling tale of international intrigue, beginning in Istanbul at the outbreak of World War II. 1994 - The Limited editions Club, New York - Number 89 of 300 copies. A beautiful copy of this superbly produced limited edition of Louis Aragon’s outstanding Surrealist novel – in which he compares a poet’s love for his city to a peasant’s love for his land – signed by Henri Cartier-Bresson on the limitation page. 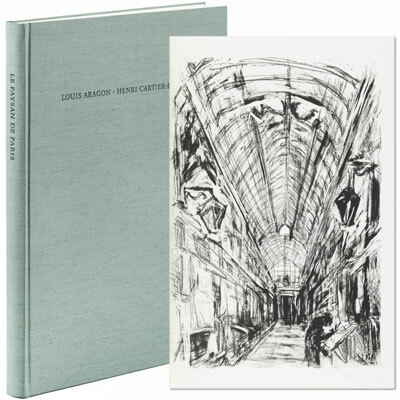 Stunningly illustrated with seven original lithographs and a photogravure by Henri Cartier-Bresson. The lithographs were pulled by Bruce Porter at his Trestle Editions studio in New York. The photogravure was printed by Jon Goodman on French-made Arjo Wiggins stock. Translated from the French by Samuel Watson Taylor. ‘Six Long Detective Tales’ which introduced the world to Doctor Reggie Fortune, a remarkable detective whose rotund frame conceals a razor-sharp mind and a fighting spirit. ‘Scotland Yard’s foremost pathologist, a master of forensic evidence, whom nothing escapes’. A true champion of the oppressed, Fortune will never let a murderer escape justice—whether his victim was royalty or the lowest of the low. The tales – The Archduke’s Tea, The Sleeping Companion, The Nice Girl, The Efficient Assassin, The Hottentot Venus, and The Business Minister. A bright example, first published in 1919, but with a dust jacket it is elusive as a Hottentot Venus, and so here we have the second edition of 1924 in scarce healthy and unrestored dust jacket showing a far from healthy lady who has clearly been stilettoed after overdosing on caffeine and thus is past restoring. Three first editions of these short story collections, together with the first full length novel, Shadow on the Wall, all featuring Doctor Reggie Fortune, a remarkable detective whose rotund frame conceals a razor-sharp mind and a fighting spirit. ‘Scotland Yard’s foremost pathologist, a master of forensic evidence, whom nothing escapes’. A true champion of the oppressed, Fortune will never let a murderer escape justice—whether his victim was royalty or the lowest of the low. Mr. Fortune Explains: Eight ‘explanations’ - The Picnic, The Little Milliner, The Wedding Ring, The Football Photograph, The Rock Garden, The Silver Cross, The Bicycle Lamp,and The Face in the Picture. Case for Mr. Fortune: Eight ‘cases’ - The Greek Play, The Mountain Meadow, the Pair of Spectacles, The Bunch of Grapes, The Sported Oak, The Oak Gall, The Little Dog, and The Walrus Ivory. Mr. Fortune Wonders: Eight stories - The Cigarette Case, The Yellow Diamonds, The Lilies of St Gabriel’s, The Gipsy Moth, The Fairy Cycle, The Oleander Flowers, The Love Bird, and The Old Bible. A fine first edition in exceptionally clean and bright dust jacket, without tears or fading, scarce thus. A fine physically fit first edition, well dressed in an exceptionally clean and bright dust jacket. Perfect for the debut of Californian Detective Virgil Tibbs. Tibbs is also extremely well read and an expert in karate and other martial arts. ‘They call me Mr. Tibbs’ was the line immortalised by Sidney Poitier in the 1967 Oscar-winning movie adaptation of In the Heat of the Night, which won the Edgar Award for Best First Novel and the Crime Writers’ Association Gold Dagger Award and was named one of the 100 Favourite Mysteries of the 20th Century by the Independent Mystery Booksellers Association. Virgil Tibbs is ‘a remarkable individual who may well end up in the great detective category.’ – The New York Times.